Solid-state 15 W combo amplifier for electro-acoustic guitar from Acoustasonic series that offers portable amplification, simple set-up and great flexibility for variety of musical performances. It is equipped with one 6” Fender Special Design speaker and provides 2 channels – Instrument and Microphone, with independent 3-band EQ and Volume control for each channel, and extra Chorus control for Instrument channel. Amplifier provides two standard 1/4" instrument inputs, XLR mic input, and headphone output. Dimensions: 181 x 284 x 292 mm. Weight: 4.76 kg. Tan/Brown colour design. 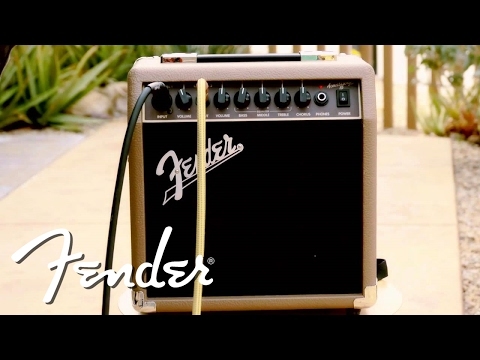 Do you own Fender Acoustasonic 15 or have you had a chance to try it? Som spokojná. Na cvičenie doma úplne postačujúce. Odporúčam. Kombo mi prislo pokazene. Huci v nom. Bol to vianocny darcek takze sa to nestihlo vratit ako zavada pri prvom odskusani. Idem reklamovat. Inac vyzera dobre. Ale neviem zatial ohodnotit kedze neviem aky mam zvuk.